Fujitsu's ScanSnap S300M takes the technology from the company's well-received desktop document scanners, such the ScanSnap S510M ( ), and puts it into a device that's easier to carry from location to location. The S300M is a speedy scanner that's very easy to use, though it does have some limitations. The S300M measures 11.2-by-3.7-by-3.0 inches when the paper feeder is folded, and weighs 3.10 pounds, including the power adapter. It fits in larger backpacks or briefcases, and feels sturdy enough to withstand daily travel; save some room for the power cable, which is attached to a 2.7-by-1.9 by-1.0-inch power brick. The S300M can also draw power from a USB port and comes with a USB-to-power cable. However, if you use bus power, you need to use two USB ports on your Mac: one for the data transfer, the other for power. The ScanSnap Manager is the main software interface for the scanner, and it's just like the software shipped with the desktop ScanSnaps. The software lets you save scans to a folder, scan and print, scan directly to iPhoto, or scan to an application, such as the bundled Iris Cardiris software for scanning business cards. You can also scan to an e-mail, which automatically generates an e-mail message with the scan as an attachment, but this feature only works with Apple's Mail ( ). If you use another mail client, such as Entourage ( ), you can set it as a target program in the ScanSnap Manager's scan-to-application feature, but then you must manually change the settings if you want to do something else with your next scan. Unfortunately, Fujitsu doesn't bundle any OCR software with the S300M. However, since you can scan to a PDF file, you can use Adobe Acrobat's OCR Text Recognition feature. The bundled Iris Cardiris ends up being a useless program because of its inaccuracy. The software scans business cards and then performs OCR to add the entry into its own contact database, but of the dozen business cards I scanned, each and every one needed major corrections. Cardiris lets you export the contact data in vCard format, which you'll then have to manually import into your contact program of choice. But since you practically have to re-input the business card data after you scan a card, using Cardiris isn't much faster than creating a new contact in your address book and typing in the data. When using the power adapter, the scanner performs quickly at its default image quality settings (called Normal by the ScanSnap Manager software, which is 300 dpi for black and white, 150 dpi for color). The S300M took only 8 seconds to scan a single-sided 1-page text document, 59 seconds to scan a 10-page single-sided text document, and 14 seconds to scan a 2-page color document containing both photos and text. Speed takes a considerable hit when you use USB power-expect the S300M to take nearly twice as long to scan. It took 14 seconds to scan a single-sided 1-page text document; a 10-page single-sided text document took 1 minute, 54 seconds; and a 2-page color document with photos and text took 27 seconds. The S300M, like the desktop ScanSnap scanners, has two image sensors, which gives the scanner the ability to scan a double-sided page with a single pass. 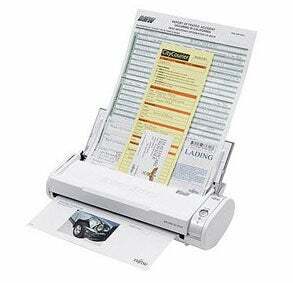 That means it takes just as long to scan a single-sided page as it does a double-sided page-about 8 seconds. Text scanned at the default Normal setting looked jaggy, much like text from an inkjet printer set to draft mode. It's usable, and it doesn't seem to affect Acrobat's OCR accuracy. Scans performed at the S300M's top image quality setting (called Excellent in ScanSnap Manager) produced dark, smooth text that was a bit thick, but looked good. Using the Excellent mode setting results in slower scan times, however; using the power adapter, the S300M took 40 seconds to scan a single page of text, five times slower than scans at the default setting. The paperless office is a nice sentiment, but there are professions that are slow to evolve from creating reams of paper on a regular basis-law, real estate, and medicine, to name a few. For mobile professionals looking for a way to manage paper documents digitally, the Fujitsu ScanSnap S300M is a good choice if scanning to PDF will suffice. But if you need OCR capabilities in order to import text into a modifiable format, be prepared to dish out some extra money.